Multi-award-winning artist Mud Morganfield is an established star in the world of Blues music. The eldest son of the legendary Muddy Waters, Mud was brought up surrounded by many of the finest Blues musicians. Possessing a baritone voice very much like his father's, Mud is blessed with a similar style of vocal phrasing and a sense of how to command a stage. Set firmly in the tradition of charismatic Chicago Blues; his big, powerful voice conveys deep emotional resonance on the slow numbers and good old fashioned testosterone-laden strut on those classic shuffles. Mud is also a writer of great new songs and is acclaimed by both critics and artists such as Buddy Guy and Jools Holland for his own musical ability, as well as being backed by some of the best musicians playing today. Born Larry Williams in 1954, Mud Morganfield (who has also gone by the name Muddy Waters Jr.), has played music all his life; he explains “Pops used to buy me a set of drums every Christmas. I started off as a drummer and gradually went to playing bass…” Supporting himself as a truck driver, just like his father did when he was first starting out, Mud didn't seriously consider being a professional blues musician until after Waters' death in 1983, by which time Mud was already close to 30: “I ran from the blues, and I ran from it, and I ran from it,” he reflects. “But it caught up with me, man." Like his father, Morganfield cut his teeth in the southside Chicago clubs, where he was soon a popular draw on the blues club and festival circuit, mixing both original songs and Muddy Waters classics into his live sets. He self-released a debut album, Fall Waters Fall, in 2008, and a ‘real’ album followed four years later - Son of the Seventh Son, which earned great reviews and was nominated for two Blues Foundation Music Awards. Mud capped a great 2012 with an appearance on the iconic BBC music show ‘Later… with Jools Holland’, and Son of the Seventh Son made the Top 50 Best Blues Albums of 2012 for Classic Rock and About.com, in addition to two Blues Blast awards. In 2015 Mud’s album For Pops (A Tribute To Muddy Waters) contained covers of his father’s earlier recordings from the Delta, rather than material his most famous material. It won a prestigious BMA and Blues Blast Award for Traditional Blues Album. Mud Morganfield plays at The Apex on Monday 22 January at 7.30pm. 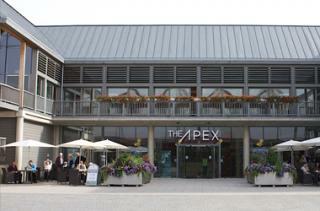 Tickets are £20, call the Box Office on 01284 758000, or visit www.theapex.co.ukfor more information, or to book.